In addition to the zebra mussel, there is a relatively new invader, the quagga mussel (Dreissena rostriformis bugensis),which is also impacting the health of our lakes. The two look similar with black stripes on tan bodies, but the quagga mussel has a rounded or oval-shaped shell. By most accounts, both species act similarly, however, while zebras primarily live in warm, shallow water, the quagga also lives in deep, cold water. Whereas the zebra can only colonize on hard surfaces, the quagga has the ability to colonize and thrive on both hard and soft substrates including sand, silt, and pebbles. Additionally, the quagga mussel feeds all year round, even in the winter when its cousin the zebra mussel is dormant. The quagga mussel also has a rapid rate of reproduction with a single mature female producing over one million eggs in a spawning season. These factors mean that the negative impacts from the quagga mussel will be substantially greater to our waters than those of the zebra mussel. While the extent of adverse impacts is still unknown due to the limited amount of time the quagga mussel has been living in the Great Lakes, there is already fear that these little creatures will be much more threatening to the health of our waters. Once a rare find, quagga mussels are now the dominant invasive mussels. In just a few years, they have completely decimated their cousin the zebra mussel. 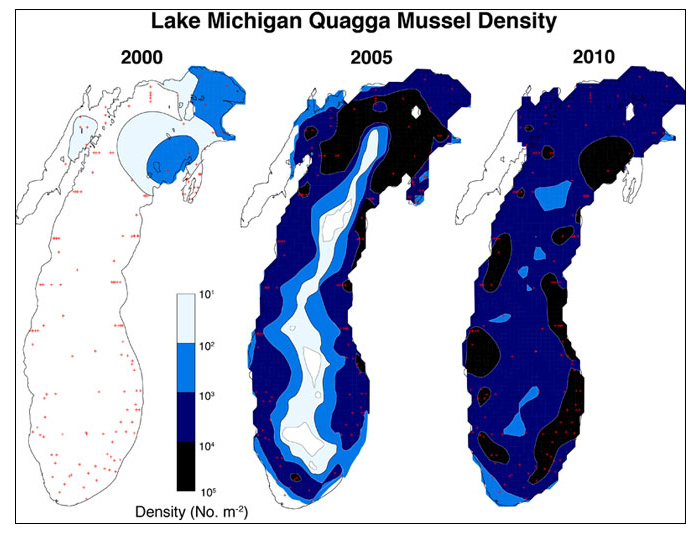 Recent studies by the National Oceanic and Atmospheric Administration Great Lakes Environmental Research Laboratories prove that quagga mussels are rapidly gaining dominance in our Great Lakes. In a 2000 survey, zebra mussels made up 98.3% of mussels collected in Lake Michigan. By 2005, the quagga mussel population had accounted for up to 97.7%. Drain your livewells, bilge water, and transom wells before leaving the water access area. Report sightings of zebra mussels to Tip of the Mitt Watershed Council by calling (231) 347-1181 or by e-mail at info@watershedcouncil.org . 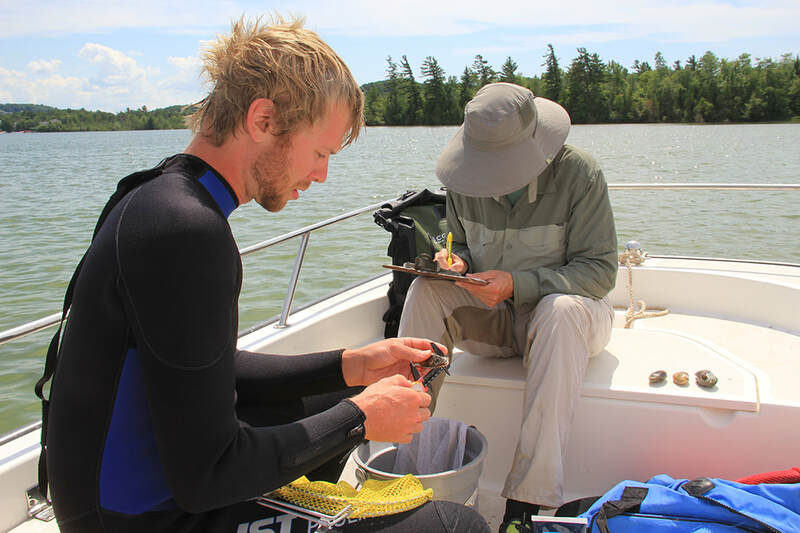 The Zequanox® Study - In 2016, the Watershed Council was awarded a Great Lakes Restoration Initiative grant to evaluate a new control method for zebra and quagga mussels. The biocontrol product Zequanox® was applied to three acres of lake bottom in Round Lake in the summer of 2017. To learn more about this program, click here. Tiny mussels are invading the Great Lakes, threatening the health of the waterways and the livelihoods of fishermen. Ash-har Quraishi of WTTW Chicago reports.